with chopsticks ... she lost! 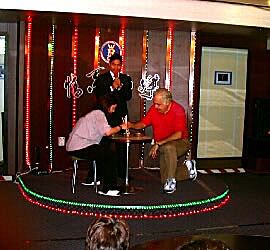 For our last night on board the Princess Elaine we would be treated to a farewell show by the crew and some contests for the guests. Both the welcome and farewell shows by the crew were enjoyable. Certainly not up to Broadway standards, or even that of the other larger ocean cruises, but enjoyable to watch nonetheless. In fact, with the amateurs among the crew included it was all the more fun. I particularly got a kick out of the ship's photographer. 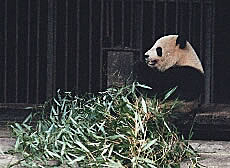 He appeared in a number of traditional dance segments and, unfortunately, he wasn't a dancer. Sorry! After the show it was back to the cabin to pack. 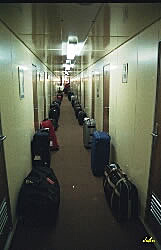 The bags had to be packed and placed outside the cabin door before going to bed. 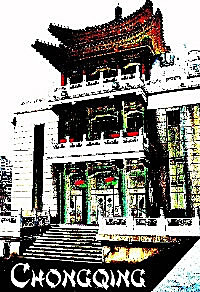 Our visit to Chongqing was scheduled to be a short one with barely enough time to visit the General Stillwell Museum and city hall before heading off to the airport and our flight to Xi'an. But we were in for an unexpected surprise. 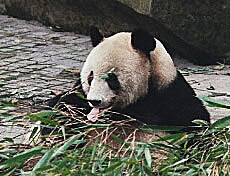 Our flight to Xi'an, scheduled for late afternoon, was canceled and we were booked on a late evening flight. 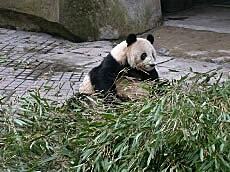 The good news was the extra time would allow us to visit the zoo and see some Giant Pandas. We were all thrilled. 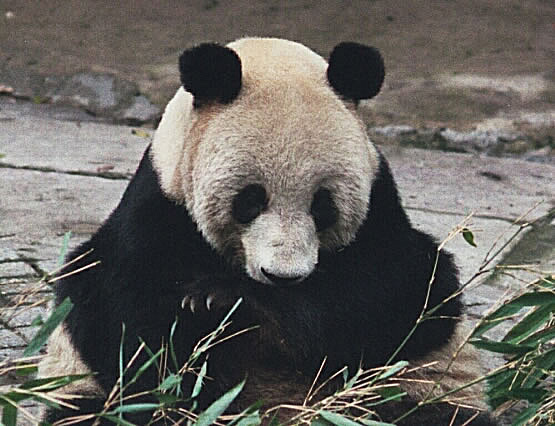 I mean, who goes to China and doesn't get to see at least one Panda?!? Our first stop was the General Stillwell Museum. 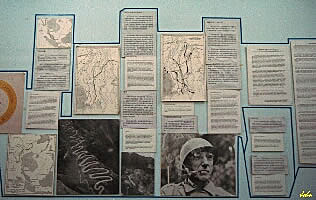 Stillwell headquarters during much of WWII were here in Chongqing and it was here that the legendary Flying Tigers were born. With my love of airplanes I looked forward to the visit only to be disappointed. The museum wasn't very interesting and had limited exhibits. I did manage to buy a nice T-shirt with the Flying Tiger emblem on it. 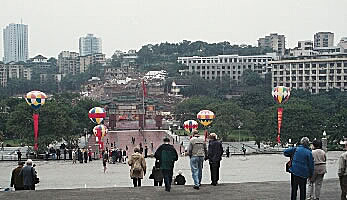 From the Stillwell Museum we headed to what I'll call Chongqing's City Hall, a large plaza with several interesting buildings and a large theater. 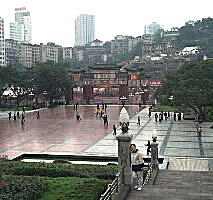 Chongqing is one of China's largest cities. 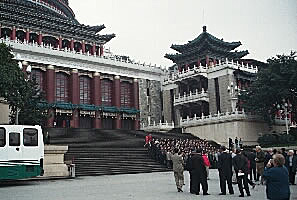 Formerly part of Sichuan Province it is now, like Beijing and Shanghai, its own municipality. 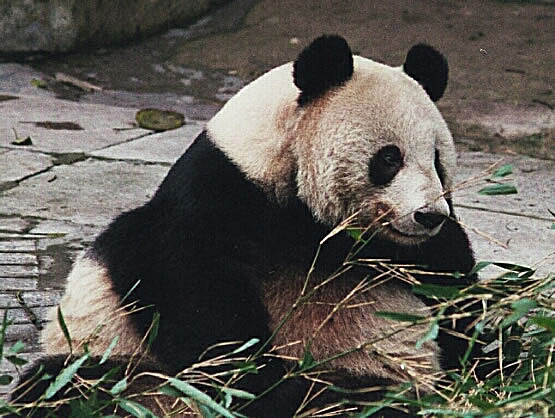 The city was built on a rocky promontory where two rivers, the Yangtze and the Jialing, meet. 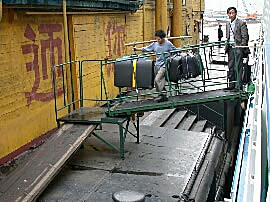 Because of its hilly location you hardly see a bicycle in Chongqing, not at all like Beijing where they are everywhere. 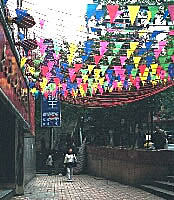 The theater building and art exhibition and sale. Having spent a few minutes roaming around the art exhibit the building was hit by a power failure and went totally dark. We were, thank goodness, near an exit so we made our way outside to wait for the others. 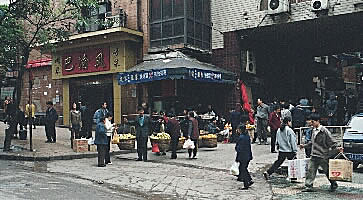 When we finally regrouped we decided to walk to a local market nearby. Unlike the previous markets we'd visited this one was inside and not outside. It was, however, exactly like all the other markets in other respects so I won't bore you with redundant pictures. 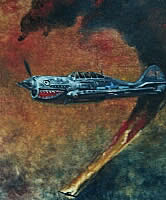 There was one picture I found interesting and am including (below). 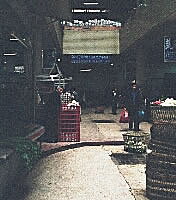 Walking into the market we saw a large sign hanging in the walkway (below left). A no smoking sign reading: "Smoking is prohibited for your and others' health. I found this comical. A sign expressing interest in public health when all you had to do was look around at the sanitary condition and safekeeping methods, or lack thereof, for food in the market. I can only imagine that this, in itself, was a major health risk. Outside the market we saw a couple of dogs roaming in the street (picture left). 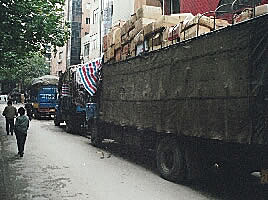 This is an unusual sight in China. 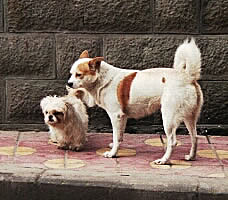 Dogs, as I've mentioned before, are not common pets for the Chinese. You see them only occasionally while walking the streets. 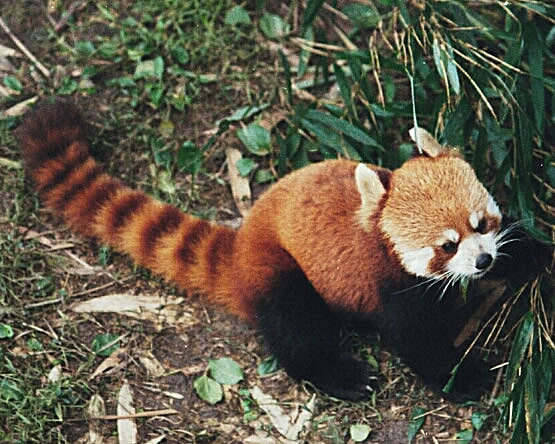 Adjacent to the Giant Pandas we found this little guy, the Lesser Panda.